Editor’s note: On June 5, Brooks Wilson was selected in the seventh round of the Major League Baseball Draft by the Atlanta Braves. Brooks Wilson was more than hopeful. Wilson had just completed a junior year of dominance on the baseball field and fully expected to be taken relatively early in the 2017 Major League Baseball Draft. Wilson led the ASUN Conference in strikeouts last year, and his tally of 127 was the fourth most for a season in Stetson history. Meanwhile, he allowed a mere three runs per nine innings pitched, outstanding on any baseball level. For good measure, Wilson also was a standout hitter, a two-way star player. Standing 6-foot-3, Wilson had a power arm and a dangerous bat. Apparently, it wasn’t quite enough. Wilson transformed from diamond in the rough to an extraordinary player on the diamond — plus he obtained a bachelor’s degree in business administration. 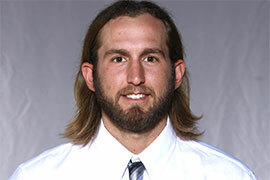 Wilson was drafted, but not until the 24th round, when the Texas Rangers selected him. Perhaps the 13thround or better, he had thought; that didn’t happen. Draft-day nerves turned into disappointment. Yet, ultimately, they brought resolve. Although he called the chance to play professional baseball an “amazing” opportunity, after a few days of thought, Wilson declined. Juniors may opt to sign to play professionally or opt to return to school. Wilson remained a Hatter. “The decision to come back was definitely not easy,” Wilson said in reflection this April. 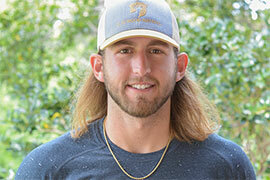 “As a baseball player growing up, it’s something that you dream of, going and playing professional baseball. When you get that opportunity, you think no way I would turn that down. But I decided to come back and play for a special team and get my degree. This time, expectations became reality. In a big way. In addition, Wilson won the John Olerud Two-Way Player of the Year Award, presented by the College Baseball Foundation. The award is named for the former Washington State University standout who achieved success both as a first baseman and left-handed pitcher during the late 1980s and who was inducted into the National College Baseball Hall of Fame. This season, Wilson not only was one of the Hatters’ top hitters but also one of the top closers in college baseball. His 20 saves marks only the 25th time in NCAA history a pitcher has recorded 20 saves in a season. And, not to be neglected, Wilson obtained his Stetson degree, a bachelor’s from the School of Business Administration. Further, Wilson is on the cusp of living his dream, finally. On June 5, he was selected in the 2018 MLB Draft — taken by Atlanta Braves in the seventh round. A fateful home run. 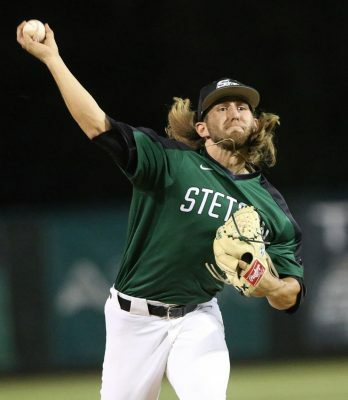 Recruited by former legendary coach Pete Dunn, Wilson arrived at Stetson in fall 2015 self-described as an “average right-handed pitcher” from Lakeland Christian High School, a few hours’ drive from Stetson’s historic campus in DeLand. Now, he’s made his own history — transforming from diamond in the rough to an extraordinary player on the diamond, helping lead his team to unprecedented heights. Much growth is evident off the field, too. In March, just as the season barely was unfolding, Wilson was among 30 student-athletes chosen as candidates for the 2018 Senior CLASS Award (Celebrating Loyalty and Achievement for Staying in School) in collegiate baseball. Hundreds had been nominated for the award, which recognizes excellence in four areas: community, classroom, character and competition. Then in late April, he was named a finalist. The winner will be announced during the 2018 College World Series. He credits Stetson coaching, for sure, especially in his impressionable early days with Dunn at the helm, along with the university’s tight-knit sense of community. “A lot of people like to go to the big schools, because it’s a more ‘cool’ or ‘fun’ thing to do,” he explained. “But you get here and realize all of these people are here because this is a place that they love. And they want you to enjoy it as much as they do. Classes weren’t easy, he added. And while professors typically were understanding, there was a distinct climate of accountability. “You quickly learn that the library is your best friend,” Wilson commented, pointing out that time management often meant making every second count on airplanes, in hotels, wherever, whenever. In the end, all the academic preparation, attention to detail and effort paid off. Just like on the ballfield. “Making sure you can get that schoolwork done makes you a better baseball player,” he said. Through the ups and downs, as well as the recent exhilaration, student-athlete stood by university, and university very much stood by student-athlete.